Our new ND555 is now here and on demonstration. Slightly inconveniently, its arrival overlapped with the set up of some rather dramatic Dynaudio Evidence Platinum loudspeakers that we’re trying out. Out of the box, driven by a single 555 PS (there is another in the wings), it sounds really rather lovely and very reminiscent of the one we heard at our ND555 event. NDX2 is due to follow on in around six weeks, we gather. Expect updates as we play with it! Wee bit embarrassed at the Nils Lofgren album being played. Yes it’s a cliche . . . but a cracking sounding album. A few customer demonstrations have helped focus things. Swapping back to the familiarity of the Kudos Titans has been handy too. Nowt wrong with the Dynaudios – far from it – but too much change at the same time is confusing. There is the inevitable bedding in period with the ND555. As with many components, it goes ‘off’ a little in the run-in. It also transpires that the ND555 seems slightly less music-server sensitive than before but that doing these things properly still makes sense. The rather impressive handset is paired with the unit in a similar way to the Uniti remotes. It also has a volume control that can be disabled, partly or fully enabled. In the ‘hybrid’ setting, it allows you to adjust the volume of streaming services but leaves the local UPnP replay unadjusted. The volume control will be a feature on all the new streamers but this does not suddenly render preamps unnecessary. We gather that it is simply a by-product of getting Apple Airplay certification. For us and a few customers, an A-B comparison with the venerable CD 555 was the ‘biggie’ and, in a Naim 552 / 500 system ND 555 utterly annihilated the CD player. The vivid dynamic and spirited performance was judged to be highly addictive and far less ‘digital’ than ever imagined. 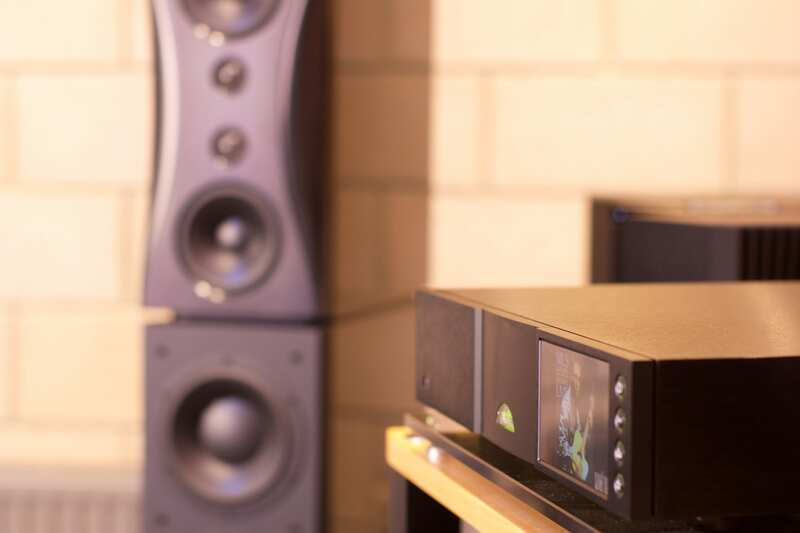 We were aware of Naim’s unease about making too much of it, so we held back on using twin 555 power supplies. Trouble is, quite a few of our customers already have twin supplies, so testing this out simply had to be done. Whisper it, but it’s bad news. It transpires that twin 555DR supplies are very effective, seemingly achieving rather more with ND 555 than they did with CD 555 and NDS. Sorry. . . But let’s not talk about that. It’s still very fine with just the one. “Have just played Tanita Tikaram and Graceland right through, and wow has the beast opened up today, boogieing like a good-un! Hopefully we have passed the down period of the day after switch on and things will now settle down and maybe even get better although hard to imagine.